I have this mission every night when I’m cooking dinner. Well, most nights. Ok, just lately. The mission is called “no vegetable left behind.” That is, I try to use (within reason) as many different vegetables that are likely to taste good together in every dish. And so far, I haven’t found many that don’t go too well together. Tonight I made a healthy and easy (yes, we like those two words used together), AND delicious (I sealed the deal for you right there) stir fry bowl. While I didn’t serve it with any carb, you are free to eat this whatever way you would like (without judgement). The best part of this delicious bowl is that it is filled with fresh ingredients that are filling and great for promoting a taught tummy. (but, you don’t have to take my word for it – go ahead, Google it). Low sodium Soy sauce, about 1 Tb. 1. Heat olive oil in large sauté pan over medium heat until heated. Add garlic, onions, peppers and jalapeños and sauté over medium heat until browned. 2. Add greens (a lot of greens, it amazingly cooks down very quickly). Sauté greens with the onion, pepper mixture until it just starts to wilt. Add soy sauce and fresh grated ginger. Stir. Add lime juice. Stir. 3. Add shrimp to pan and toss with ingredients. Cook for several more minutes, or until shrimp has turned pink and greens have cooked down and wilted. 4. 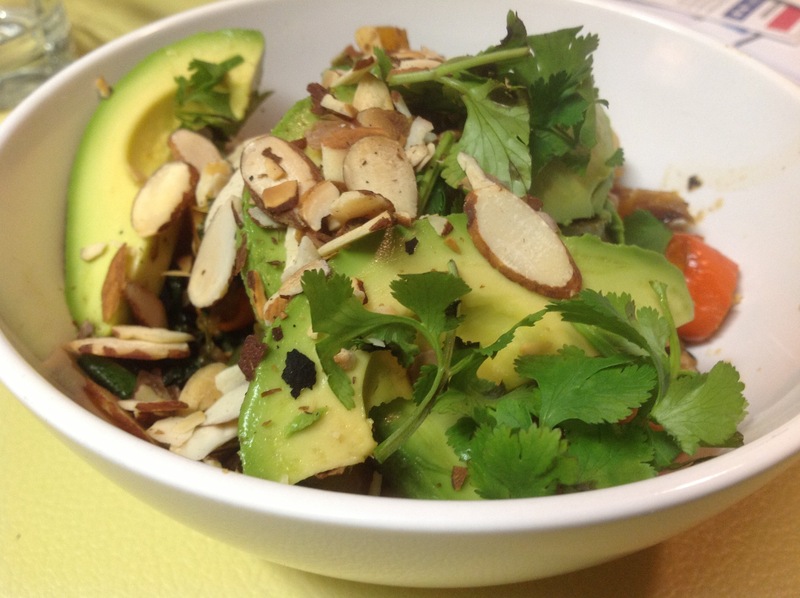 Scoop into bowl and top with sliced avocado, toasted almonds and cilantro. Enjoy! Leave me a comment and let me know how you liked it. Posted in Clean Eating, Dairy Free, Low Calorie, Palate Pleasers, Weeknight Dinners and tagged almonds, Asian flavor, avocado, bell pepper, bowl, cilantro, clean eating, cook, Flat belly, Flat belly foods, garlic, healthy cooking, Jalapeño, jalapeños, lime, low carb, olive oil, onions, peppers, Sautéing, seafood, shrimp, soy sauce, Stir Fry. Bookmark the permalink. Yummy fish cakes. Cool tangy avocado cilantro lime slaw. Yay, no mayo! As one who grew up not eating fish very often, I sure love it as an adult. Not only is it yummy and versatile, it also cooks in record speed and is one of the most healthful animal protein sources that I know of. I love playing with sweet fruit flavors in my recipes and complimenting them with fresh herbs and spices. My favorite herb has got to be basil. Lots and lots of fresh FRESH basil. If it isn’t large quantities of garlic and onions, I am probably using fresh basil more than any other ingredient. I just wish I could keep my plant alive so I didn’t have to keep buying it at the store. I know, I know…Woah is me. Just as I was finishing up my last post (Low Calorie Shrimp Jambalaya with Egg Noodles), I was trying to think of what I wanted to make for dinner next. I was feeling void of inspiration for a short moment. A cloud of anxiousness covered me…. suddenly I feared that my blog would only EVER (E-V-E-R!!!) have four posts (at least it’s more than the first blog I started). Ok, ok I am slightly embellishing the feeling I had. One thing that I love about cooking and food is that I am pretty much ALWAYS thinking about it, so it doesn’t take me long to come up with my next recipe (thus why I keep a notepad on my phone to keep notes of dishes I want to make). There is actually a running joke in my family that whenever we eat together, I have always said, “You know what we should have had?” It’s not that whatever we are ever eating isn’t worthy of praise and interest at that very moment, I am just always forward thinking and onto the next… meal. And… back to the topic at hand. Fish. Fish cakes are easy, yummy and a great way to mix up the normal fillet routine. You can use fresh or previously frozen fish in nearly any variety… salmon, cod, halibut, tilapia and lots more. Plus the ingredients you put into them can be changed up to suit your fancy, but you’ll definitely want to try my recipe to get you on your way to fish cake fanaticism. The slight sweetness of the pineapple coupled with the herby basil notes and then topped with the creamy lime cilantro dressing and crunch from the slaw make for a wonderful taste combination. The slaw also absolutely does not have mayo in it, because like you will soon come to know… I LOATHE MAYONNAISE! I find it vile and so gross, so I find ways around using it, or just don’t use it at all. You’re welcome, the calories weren’t welcome in this recipe anyways. Oh, and did I mention this recipe is dairy free and gluten free! Yeah, well it is… so also healthier, so eat up! If you buy fish when it is on sale or in the frozen fillets, you can save big money. We happen to buy almost all of our groceries at Grocery Outlet. Most people are amazed at that, because we certainly don’t survive off Ramen and Hamburger Helper in this house, that is for sure. We definitely are on a budget, and I am able to buy an assortment of fresh and frozen organic produce most of the time as well as wild caught fish for usually about half the price of normal grocery stores. I just love it there, and they have a fairly decent wine selection too. 1. Start assembling the slaw first. Put the shredded cabbage in a medium bowl. 2. Plug in food processor. Scoop flesh of avocado into food processor, lime juice, cilantro, garlic and kosher salt and blend until smooth. Drizzle EVOO into processor until thinned enough that it can be mixed into slaw to dress cabbage. Taste and adjust seasonings accordingly. 3. Scoop dressing out of processor and toss with shredded cabbage until covered. Place into fridge while assembling rest of meal. 4. Rinse out food processor to begin preparing fish cakes. 5. Put pineapple, garlic, kosher salt, bell pepper, basil, chili flake, lime zest in processor and blend until combined and finely pureed. Add fish and again pulse until incorporated with other ingredients. 6. Heat frying pan on medium high heat with 1 Tb. vegetable oil. 7. Scoop out 1/4 cup of fish mixture and place into heated frying pan. Press the fish mixture down to form a patty. Cook about 1 minute each side. Take out and place on a plate with paper towels to soak up excess oil. 8. 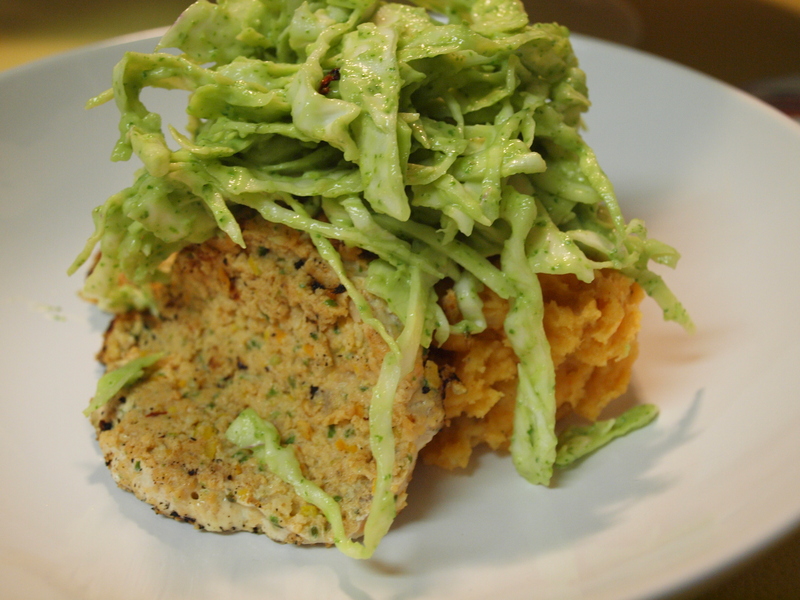 Plate fish cakes and top with a heavy helping of slaw. Enjoy! Note: We made mashed potatoes seasoned with my cajun spice mix as the other side for this. These weren’t GF/DF, so I omitted them from the post. Posted in Dairy Free, Gluten Free, Low Calorie, Palate Pleasers, Weeknight Dinners and tagged affordable cooking, affordable fish, affordable food, avocado, basil, bell pepper, cabbage, canned pineapple, cheap cooking, cilantro, cod, cole slaw, cole slaw recipe, cooking fish, cool, dairy free, dairy free cooking, dairy free recipe, extra virgin olive oil, fillet, fish, fish cake, fish cakes, fish fillet, fish fish, fish recipe, food processor, fresh basil, fresh fish, fresh herbs, fresh organic produce, fresh pineapple, fresh spices, frozen fish, frozen produce, fruit flavors, garlic, garlic clove, gluten and dairy free, gluten free, gluten free cooking, gluten free recipe, Grocery Outlet, halibut, Hamburger Helper, herbs and spices, home cooking, homemade, kosher salt, lime, lime juice, lime zest, loathe, low calorie, mandolin slicer, mashed potato, mayonnaise, no mayonnaise, onions, organic produce, pineapple, Ramen, recipe, red chili flakes, salad dressing, salmon, save money, shredded cabbage, slaw recipe, tangy, tilapia, vegetable oil, wine, yummy, zester. Bookmark the permalink.